In the first few weeks after having a baby, 80 percent of new mothers experience feelings of sadness that eventually go away on their own, according to the National Institute of Mental Health. Drops in estrogen and progesterone levels after childbirth leave women feeling weepy and fatigued. “It’s like you’re having a bad case of PMS,” says Diane Sanford, PhD, coauthor of Life Will Never Be the Same: The Real Mom’s Postpartum Survival Guide (Real Moms Ink, 2010). But up to one in seven moms goes on to suffer the more severe symptoms of postpartum depression, which may include feeling hopeless, irritable or overly anxious, plus crying more than usual and having difficulty bonding with the baby. Instead, postpartum depression resembles clinical depression. Symptoms of sadness deepen and do not improve over time. 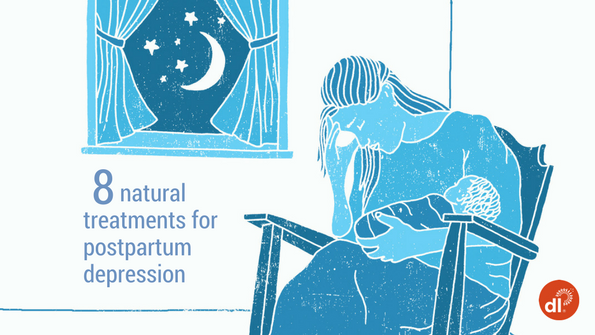 Postpartum depression usually requires treatment, ranging from counseling or talk therapy to antidepressants, or both. But for mild postpartum depression, in conjunction with these treatments, or for women who prefer to avoid medication while breast-feeding, for instance, some natural remedies can also make a difference. Poor eating habits can throw your system out of whack. In a 2010 study printed in the American Journal of Psychiatry, a diet of processed or fried foods, refined grains, sugary products and beer was associated with higher odds of depression or anxiety disorders. “Getting adequate nutrition helps a great deal, and that means eating at regular intervals, and ingesting body-building and health-enhancing kinds of foods instead of fast foods and sugary things,” Sanford says. To make this easier on yourself, keep food simple and convenient: Cheese sticks and whole-grain crackers, handheld fruit, cut-up vegetables, yogurt and instant oatmeal can keep you out of the drive-through line. Experts also recommend avoiding caffeine, which can make your mood worse. “A lot of younger moms will drink a bunch of diet sodas or coffee to keep themselves awake and alert, and it’s actually fueling their anxiety,” Sanford says. The same goes for alcohol, which is a depressant and can decrease serotonin, a mood-regulating chemical in the brain. This is difficult, but it can make an enormous difference. Poor sleep, not surprisingly, is associated with depression. And as hard as it is to try to sleep when the baby sleeps during the day, it’s also a good opportunity. Let the house go, and get some shut-eye when you can. Studies suggest that low levels of omega-3 fatty acids can contribute to postpartum depression, and that supplementing your diet could lessen symptoms. “The doctors we work with really love to suggest omega-3 fatty acids,” Waller says. You can get omega-3 fatty acids from supplements, as well as some foods, such as seafood, flaxseed oil, fish oil, chia seeds, walnuts, soybeans and spinach. If you’re lactating, aim for 625 mg of DHA and 410 mg of EPA every day. Also, up to 10 percent of women develop postpartum thyroiditis, which can cause hypothyroidism resulting in fatigue and depression. For this reason, any woman who experiences symptoms of depression in postpartum should be checked for thyroid disorders. To be thorough, also ask to be tested for anemia and B vitamin deficiency. When doctors ask if you’re getting exercise with your new baby, they don’t mean you should be training for a half-marathon. “We really mean, ‘Are you getting out for a walk 15 minutes a day with the stroller?’” Waller says. One analysis of previous research from the Philadelphia College of Osteopathic Medicine found that aerobic exercise can be an effective way to boost your mood. Talking a walk outside has the added benefits of getting you out of the house and exposing you to fresh air and nature. 5. Get some bright light. It’s well-known that more people feel down in the winter months, when sunlight is reduced. Light has a positive effect on mood. In a study conducted at Northwestern University on depressed pregnant women, an hour of bright-light therapy per day improved their depression symptoms after five weeks, compared to therapy with a dimmer light. You can create your own bright-light therapy by taking a one-hour walk outside in the morning. In one study, depressed mothers who received two massages a week for five weeks markedly decreased anxiety and stress levels. In another, mothers who attended baby massage classes with their infants showed lower levels of depression afterward and better interactions with their babies overall. And although the research is still developing on acupuncture for postpartum women, studies of regular acupuncture on depressed pregnant women have shown positive results. Waller notes that although these therapies can work, if you don’t feel that you’re improving or you’re worried that you might harm yourself or your baby, you should seek medical attention. “At our practice, we’re cautious with depression because it can be so serious, and undertreatment can have consequences,” Waller says. “While I encourage my clients to use any kind of self-care or alternative treatments available to them, I also want to make sure they’re being seen by a doctor and monitored medically. In the most severe cases, natural treatments are simply insufficient, and we don’t want to prolong a woman’s suffering.” If for any reason you have been wrongfully treated, then click here for any medical negligence claims. Studies indicate that mindfulness techniques combat postpartum depression, and there are a variety of ways to go about it. Meditation, for instance, doesn’t have to be about carving 20 minutes out of your day to practice quiet reflection. At a stoplight, take a few deep breaths and pay attention to your breathing. Or take five minutes in the morning and evening to put your hand on your belly and notice your breath as it flows in and out of your body. “You don’t have to go out of your way,” Sanford says. By Kate Ashford, Illustrations by Matthew Allan, Originally published on Delicious Living.